Principles of Web Design leads you through the entire Web site creation process, from start to finish, while developing and enhancing your HTML, CSS, and visual design skills along the way. You'll begin by learning about the Web design environment and the principles of sound Web design, continue to planning site layout and navigation, and progress to Web typography, colors and images, working with CSS, and more. 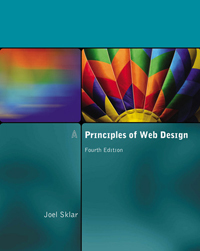 Updated to include the latest Web design technologies and trends, this Fourth Edition features all-new sections on Web accessibility, standards-based coding, and CSS positioning, as well as technical updates and new screen shots throughout. Armed with valuable knowledge and plenty of hands-on activities, you will gain a solid understanding of designing successful, standards-based Web sites that are portable across different operating systems, browsers, and connection speeds. As you progress through the book, you can practice Web design techniques with the exercises and sample files you'll find here at the Online Companion Web site. Principles of Web Design is intended for anyone who has a working knowledge of HTML and wants to apply those skills to the task of designing attractive, informative Web pages. To work effectively with the content of this book, you need to understand the basics of HTML at the code level. You may have taken an introductory class in HTML, or taught yourself HTML with the help of a book or the Web. You should be able to build a simple Web page that includes text, hyperlinks, and graphics. Additionally, you should be comfortable working with computers and know your way around your operating system, whether Windows, Macintosh, or UNIX. A Web browser, such as Microsoft Internet Explorer 7.0 or later, Mozilla Firefox version 2.0 or later, or Opera version 6.0 or later. A code-based HTML editor, such as Adobe Dreamweaver, one of the many shareware editors, or a basic text editor such as Notepad on the PC or SimpleText on the Macintosh.